A few people have told me they are done with the 2011 sailing season but the truth is October has some of the best winds of the year. To be honest this year had more wind than the last 3 seasons and its taken its toll lets recap. Prindle 18 – snapped mast and major fiberglass damage. 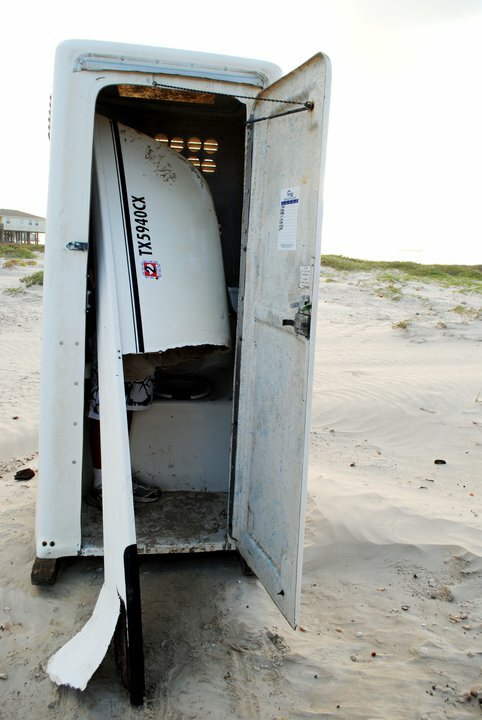 Hobie 18 – Snapped hull destroyed boat. Nacra F18 – Hull damaged and sails destroyed. These were just the recreational sailors boats, many teams in the GT300 also suffered major damage this year. I recall Teddy saying after the dash that the waves off east beach were huge. We had a great launch party at the beginning of the season and I planned to have another event like it but every week I would check the forecast it was rough & high winds. It also didn’t help that my H18 was on this list kinda hard to invite people out when you are hoping to get a ride yourself! Lol! I remember the day of the learn to sail clinic it was blowing hard same for Wayward winds we hit 20 on my H18 sailing in the east bay click here to see the video. All of these days were really windy but October 1, 2011 morning of the Redfish Reach proves my point the Texas City Dike had wind-blown surf , halyards were popping against the mast like crazy and my wind app showed 23 mph during the skippers meeting. October brings the big winds so if you’re not ready to end your season and your boat is still seaworthy you’re in luck! I did not get to the beach as often as previous years due to boat trouble but this was still one of the best so far! One of my best sailing days at Cat Alley on my H18 with Omar crewing. Sank my Hobie 18 at Surfside day before the dash with Rob (lake sailor) Sorry buddy! Redfish reach on the Tiger with Mike crewing was so much fun! Thanks Mike! I plan on getting out a few more times before the holidays but man what an amazing year it has been! To those of you who are done this year keep an eye here I have a few ideas in the works for your winter reading pleasure. ~ by Floyd on October 11, 2011. Dude I just found this doing a google search for a 5.5 part. Page 3 but not bad. I’m not making this list next season..